An airman has been found not guilty of intentionally failing his PT test so that he could he could get out of the Air Force and collect nearly $10,000 in involuntary separation pay. Prosecutors accused Staff Sgt. Coty T. Ferguson of bragging that he planned to fail the PT test so that he would be demoted, forcing the Air Force to boot him because he would be over his high-year tenure limit. 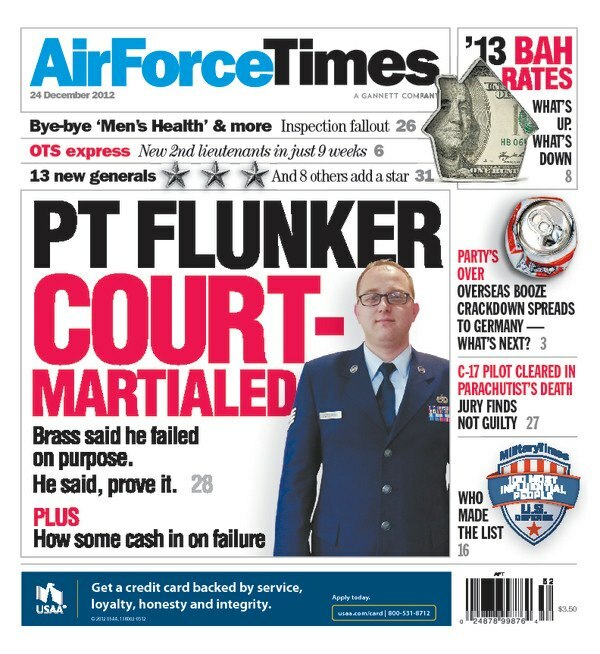 You can read about his court-martial in this week’s Air Force Times. Also this week: Only 10 months shy of retirement, Staff Sgt. Scotty Pigg may face dismissal because his waist measurement is half an inch more than the Air Force allows. The 19-year veteran had no problem with the situps, pushups and 1.5-mile run portions of the PT test, but he has struggled to meet the waist requirements of the tougher physical training standards introduced in 2010. In other news, the Air Force plans to shorten the basic officer training course from 12 weeks to nine in 2013. The move is meant to increase the number of officers who graduate the course. And read about the 100 most influential people in defense: an exhaustive list of who’s who, including Air Force Lt. Gen. Christopher Bogdan, head of the F-35 Lightning II Joint Program Office, and Army Pfc. Bradley Manning, who is charged with leaking classified material.